Welcome to the next wave of adventures from Ahoy Comics! 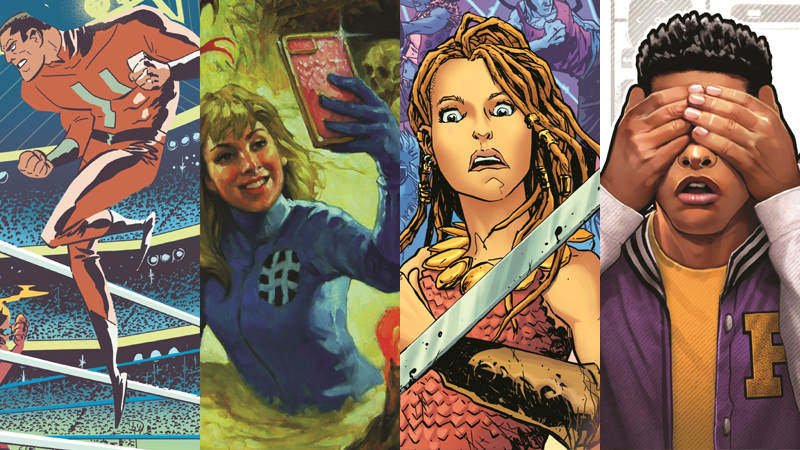 Last year, indie publisher Ahoy Comics hit the ground running with a launch that brought us refreshing and fun twists on everything from superheroes to classic horror comics. But now the publisher is ready for more—and io9 has an exclusive first look at the new titles its bringing to the table in 2019.
io9 can confirm that the next wave of Ahoy Comics books will begin in a few months time, with four new banner comic “magazines” launching across April, May, and June: Bronze Age Boogie, Planet of the Nerds, Hashtag: Danger, and the one-shot anthology Steel Cage. As with prior Ahoy titles, as well as the main comic stories, each issue will include an eclectic mix of backup material, from prose, to poetry, to even crossword puzzles, giving readers more bang for their buck with every issue. Here’s the lowdown on each of the new titles. Kicking off the second wave on April 3, Stuart Moore and Alberto Ponticelli’s Bronze Age Boogie follows the adventures of a young warrior princess named Brita Constantina, who finds herself battling cosmic threats from Mars not just in 1975 BC, but across time into 1975 AD, too. Expect swords, sorcery, martians, and apparently the first bear in space, Major Ursa. Following Boogie on April 17 will be Planet of the Nerds, by Paul Constant, Alan Robinson, and Randy Elliott. An homage to the classic teen nerd movies of the ‘80s, Planet’s twist is another timey-wimey one. Three jocks from the height of the eternal Nerd vs. Jock battlegrounds of ‘80s high schools find themselves cryogenically frozen, and woken up in 2019: where comic book movies dominate the box office, pop culture fandom rules the roost, and nerds are... well, at least kind of cool, much to their horror. May 1 sees the launch of Tom Peyer and Chris Giarrusso’s Hashtag: Danger, a modern take on a Fantastic Four-esque team of scientific explorers (in this case a trio rather than a quartet) as they boldly explore supernatural mysteries, strange worlds, and ancient civilizations, and find out if the dangers lurking beneath all those things will kill them before they manage to kill one another. Rounding out the wave on June 26 is an altogether different beast for Ahoy: Steel Cage, a 3-in-1 anthology standalone. Featuring three “pilot” tales from Mark Waid and Lanna Souvanny, Tom Peyer and Alan Robinson, and Stuart Moore and artist Peter Gross, Steel Cage will invite readers into three worlds—tales of intergalactic adventures, superheroic drama, and the dark story of the smartest man on earth—that they can then vote on to decide which will be crowned the victor of Steel Cage. The reward? Becoming a new ongoing comic series! With its first wave of comics magazines, Ahoy Comics proved that there’s a place for weird, wonderful series on store shelves that are more than just a monthly story. Its second wave already seems to be living up to that promise too—and we can’t wait to see where it goes from here. The next wave of Ahoy Comics magazines officially begins this April.